Your “ Me” page is where you can see all your assignments and activity. From here, you can make updates to your personal info, like your email address, photo, and other preferences. 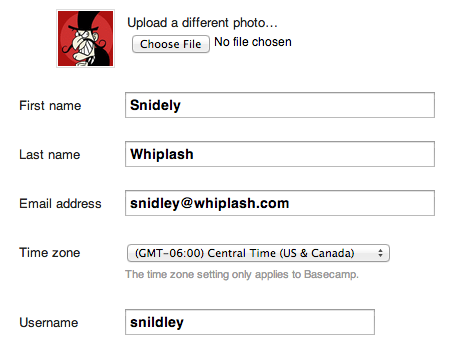 Your email addresses: You can set two email addresses in Basecamp 2. One is for your ID & password -- that's where we'll send your password reset emails. The other is for your notification emails. If you're a member of multiple accounts, you can set different email addresses for each account. Perfect if you want to keep your work notifications separate from your personal notifications! Your notifications address is the address that other people on the account will see for you. Update your personal info: Change your password, username, avatar, time zone and email address. Make your changes. Changes on this page will affect every account associated with this ID. If you update your photo and don't see the change in Basecamp right away, hold your shift key and refresh the page. Learn about your Basecamp 2 notification settings.